This van has folding furniture .... a delivery van and a mobile home, two in one. Here is a series of 5 high quality videos of a very interesting and well done pop up truck camper with potential to be a slide-on for a utility trailer. According to the 5th, it weighs just 370# (I assume empty except for battery pack etal). He used 3/4 inch plywood frame members with 5mm ply exterior covered with PMF. Inside is 1/8 inch paneling over 3/4 inch foam. Lots of good ideas in all 5 installments, but if you only watch one, I find the 3rd the one to view. I am unable to summarize the Ramblin Rogers Folding Micro Camper in one sentence, but here are a few words to wet your appetite: bifold pop up with bowed roof, solar heater, solar power, foldout, kitchen galley, and a lot more. He also updated his build with a Vardo and a tent top design.Here is a link to the first of a series of videos to let you judge for yourself. Visit his page for the details. 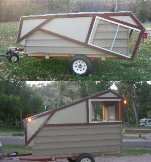 Here is the latest DIYtinycomper.com folding camper video (check my earlier posts for parts 1 & 2). I find this the best video of the three. The big attraction with this camper is the 2:1 open to closed footprint ratio with large standing area. But big footprints need big roofs stable against both wind and rain, and that is a challenge for any folding trailer, including this one. The latest configuration replaces the tarp roof with a folding panel of aluminum ribs with polycarbonate green house glazing (not cheap). But is that better? I'm not sure I like a full roof skylight, and although a simple tarp top is far from cool, I do like the flexibility & economy of an insulated/semi-reflective fabric top. If I were building his design, I would definitely consider a roof with a bend/ridge/peak to avoid center sag and puddles, perhaps by reducing the height of at least one of the (8 foot long) side walls (which might need moving the door to the back end to maintain entry height if the door wall height is reduced). On the same note, it is not clear to me what prevents pooling in the closed configuration, perhaps he uses a travel cover. And what do you do with the mattress when you flip the bed upside down during closing? I plan to keep watching this one.